Our new Professional Grade Full-size Flexible Silicone Waterproof USB Keyboard in Black is designed with comfort and usability in mind. Professional Grade, comfortable in almost any environment - home, office, travel, call centers, medical, food safety, manufacturing, industrial. Its high-typeability rating makes it a low-cost replacement candidate for standard traditional ABS plastic keyboards and other less user-friendly rubber keyboards. 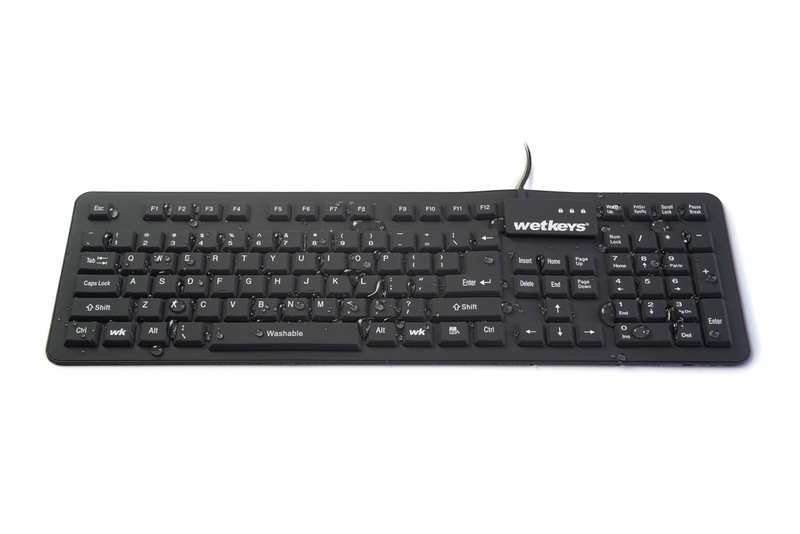 The molded silicone rubber keyboard is long lasting, light-duty and fully sealed allowing for frequent sanitizing, regular wash-downs and dusty, dirty or wet environments that would damage an ordinary keyboard causing data entry errors during use. 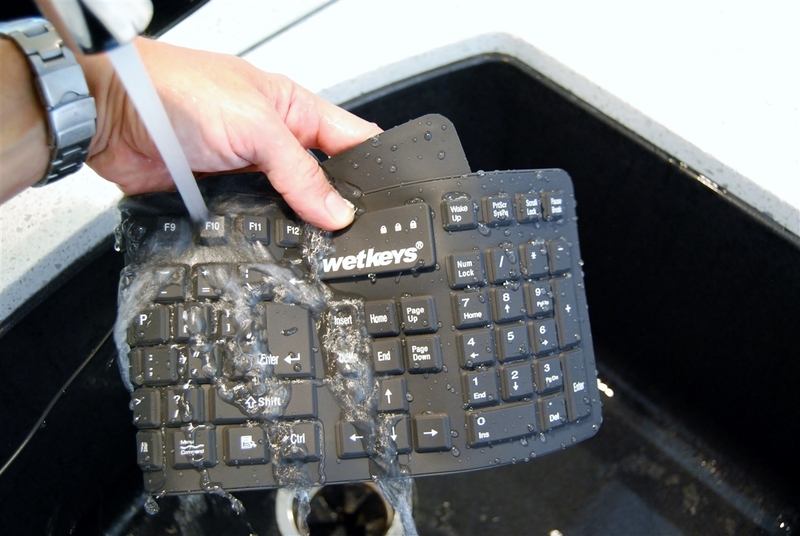 Light-duty washable full-size keyboard that's fully sealed, waterproof, flexible is rated NEMA-4x and IP67. It's easy to remove dust and debris, clean with water/soap or disinfectants to improve cleanliness and reduce the risk of cross-contamination. 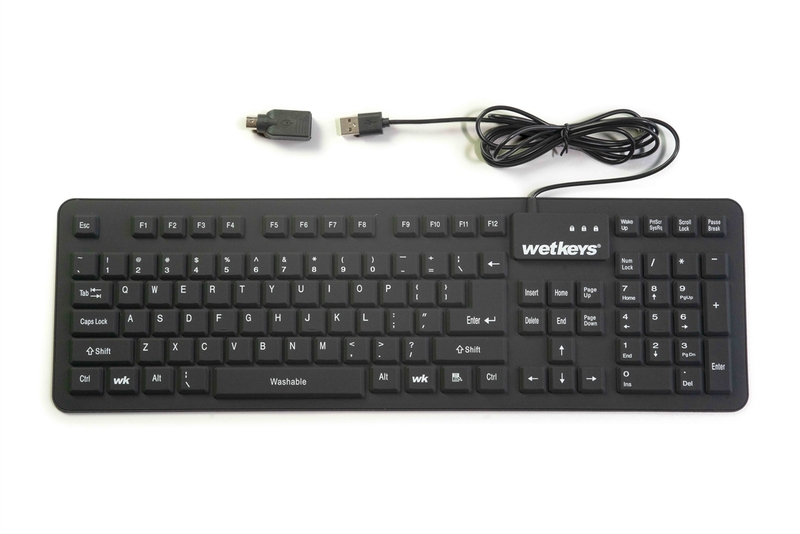 The WetKeys-brand low cost USB keyboard is notably higher quality than other flexible silicone keyboards on the market. Ideal for portable travel use or where hand-hygiene is important. It's so portable, you can "Bring Your Own Clean Keyboard" (BYOCK) while traveling, or anywhere you type with liquids, food or dirt - or simply want to avoid germs! Includes a reusable plastic carry case for safe storage and travel. Traveling? Add a drawstring travel bag ( CCWK59HD-BW) and save an additional $5. Don't wrestle with your computer CPU trying to reach the UBS ports. Add a "quick disconnect" USB extension cable ( USBECMF) to make disconnecting, cleaning and travel easier. 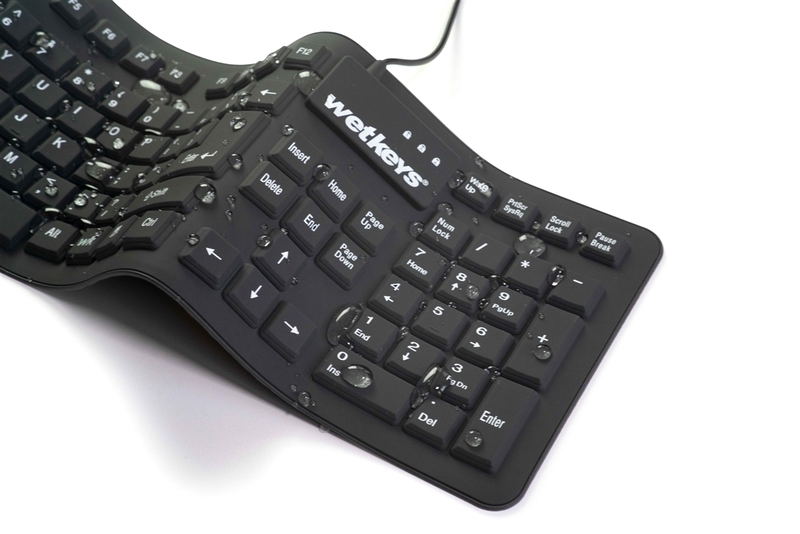 No gaps or openings where dust, debris, water and other liquids may damage or impede keyboards functions. 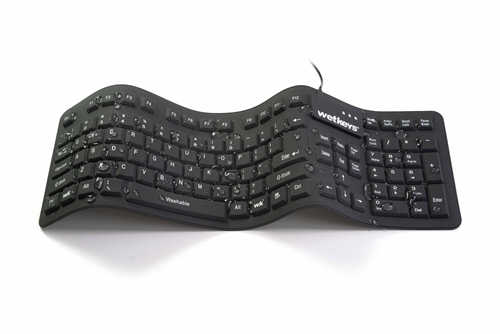 Let's you get messy and be creative without worrying about damaging your keyboard - it keeps on working! Can withstand safety wash-downs or being immersed in antibacterial solutions and rinsed under a tap to reduce the spread of germs. Ideal for medical offices, laboratories and schools. Dimensions: 17.75" x 5.5" x .25"
Keyboard + Travel Case Weight: 10.1 oz.